Last week, over the Thanksgiving holiday, I had a little taste of heaven. I spent the week with Riley, our seven month old granddaughter. Of course, there were a few others present as well: Stephanie and Matt, and Rob. But this was the first time that Riley was with us as a distinct personality, and it was a joy to experience. When Riley was born this year on April 22, weeks premature, my first view of her was in a NICU incubator crib with a baby CPAP mask covering her face. Although she was generally healthy, her lungs were a bit immature and she needed a few days of monitoring and growth before she was ready to leave the hospital. That was an anxious time, an introduction to a newborn, tinged with fear as well as the joy of welcoming new life to the family. She was so tiny, so fragile, so remote. We saw her again in late June, a two month old who had outgrown her need for additional oxygen, who was a growing and healthy infant. But at that visit, although she was a warm and snuggly little armful, she was still sleeping most of the time, still an unknown entity. The little one I just met is a happy and contented baby, responsive to play, to laughter, to the things she already recognizes as “good:” her bottle, her pacifier, a favorite toy, her parents’ faces. She sings, long drawn out noises that are more than just baby words. She is already expressing joy, finding her voice. Little Riley is just beginning her journey, but in the space of a few short months she has grown in size and being. She’s becoming a person. She’ll make a unique contribution to the family dynamic. I’m excited to see her again in a few weeks to learn how she’s changed. 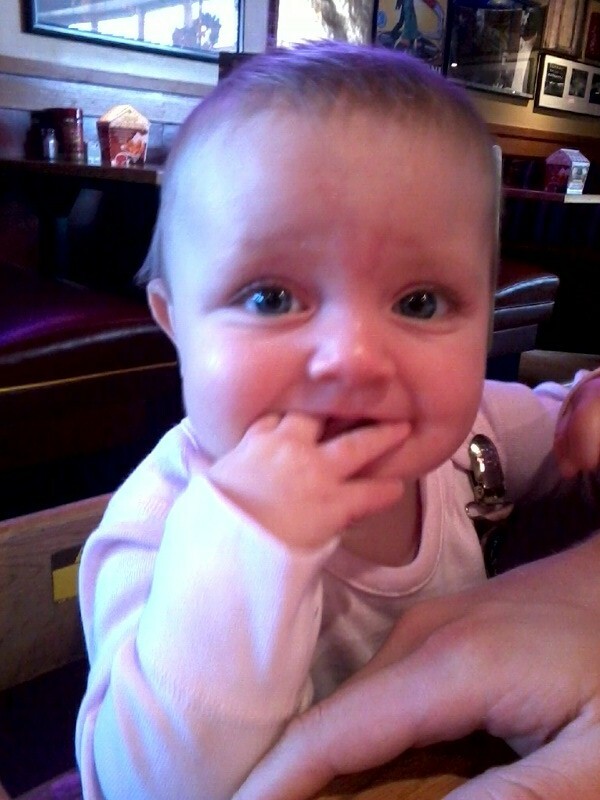 Last week, she was on the brink of crawling, she was teething. She’ll be more mobile at Christmas, I’m sure, and maybe there’ll be a tooth or two showing in her smile. I’m honored and humbled, once again, to watch the miracle of a young life, growing and absorbing the world she has entered. It will be a journey for both of us. I think I’ll like being “Gram” after all. After all, watching her is reward enough for taking on the title of grandmother. ← How does this help?